I’m ready for apple season, but haven’t found them on sale locally yet. In the meantime, I’ve been bringing home piles of pears at $.99/lb. Being the muffin lover that I am, I decided to search for a new recipe to help use up my abundance of pears. I based this one on an Apple Strudel Muffin recipe at All Recipes and modified it just a bit. They’re very moist and perfect for breakfast or as a snack. I’ve made them twice this week! Preheat oven to 375 degrees. Grease a 12 cup muffin pan. Mix flour, baking powder, baking soda, and salt in a medium bowl. In a large bowl, beat coconut oil, sugar and eggs until smooth. Stir in vanilla and 1 teaspoon cinnamon. Add diced pears, then gradually blend in the dry ingredients. Spoon the batter into the prepared muffin pan. In a small bowl, combine brown sugar, flour and cinnamon. Cut in butter until mixture resembles coarse crumbs. Sprinkle over tops of muffins in pan. Bake for 18-20 minutes or until a toothpick inserted in the center of a muffin comes out clean. Allow to sit in pan for 5 minutes before removing. Cool on a wire rack. 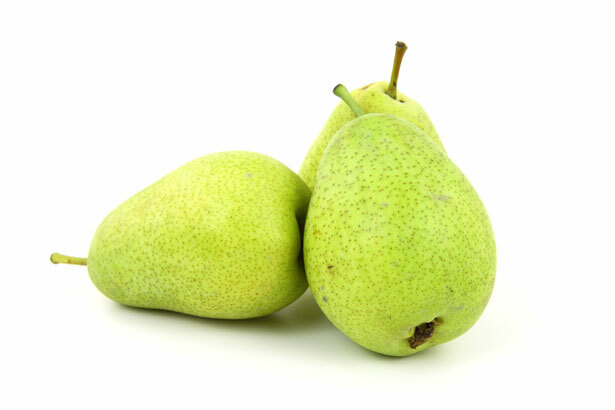 Any other suggestions for pear recipes? I was drooling just reading the title of this post!!!! Sounds like a easy and yummy recipe!!! I'm currently obsessing over a healthier Honey Fig Clafoutis recipe. If it turns out at all, I'll blog about it, and I'm SURE you could do pears in it, instead. Sounds so fancy & is SO EASY! This looks really yummy – wonder if my hubby would try them?? Hmm…. Yum! I'll have to give these a try! Thanks for sharing. And they must be good if you've made them twice this week! I'll be looking for pears at the grocery store. Hope that does turn out – sounds like it would be delicious! I've never cooked with figs, but maybe I should give them a try. I'm picking up 1/2 a bushel of pears today. I'll have to give this recipe a try. Boy, do these sound good! Mmmm!